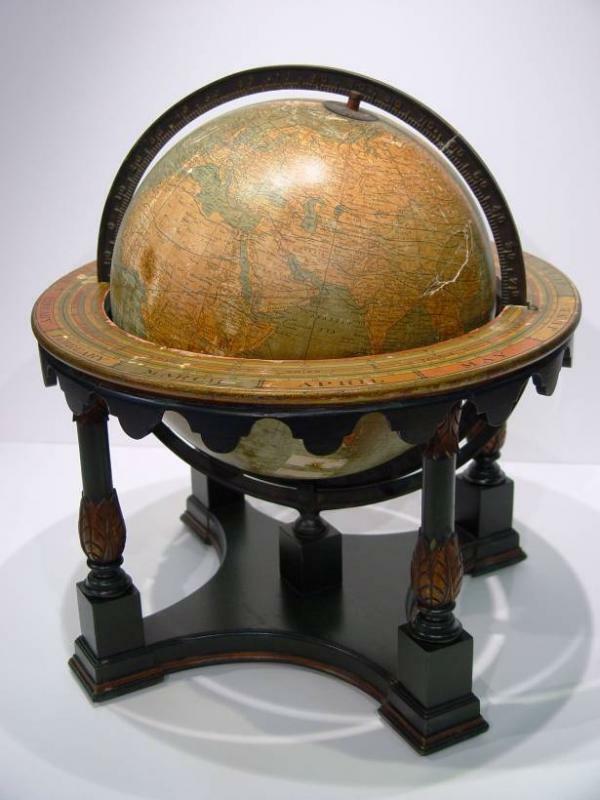 Globes were initially engraved or painted directly on spherical shells. In the late 16th century, globe-makers began printing maps and pasting them onto round shells made of solid wood or hollow wood stuffed with layers of paper. Some were made of blown glass, marble or metal. The maps were divided and cut into panels (gores) with curved sides tapering to a point at the north and south poles, so that when applied to the surface of the shell, they create a complete three-dimensional map of the world. Antique and vintage globes, even if they are damaged, can have a useful and productive second life with a little work. The wooden shell was covered with pasteboard and chalk to create a uniform and smooth surface on which the gores representing the terraqueous globe or the celestial sphere were pasted in the proper order. 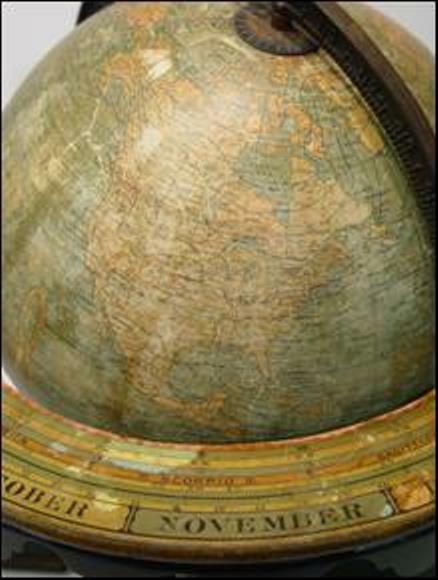 A meridian ring or semi-circular band usually made of metal, arches around the globe on the axis connecting the poles. The globes axis was tilted at about 23 degrees from the vertical to reproduce the Earth’s tilt on the plane of its orbit. The horizon ring is a circular band that is typically made of printed paper laminated to wood or metal. It wraps around the equatorial area of the globe containing calendar or zodiac signs. The horizon was supported by three legs in the English mount and by four legs in the Dutch mount. A small, thin metal circle on the top of the globe called the hour circle. It is divided into 24 segments and imprinted or engraved with the hours of the day and night. By turning it, one can calculate the time difference between various locations on the globe. 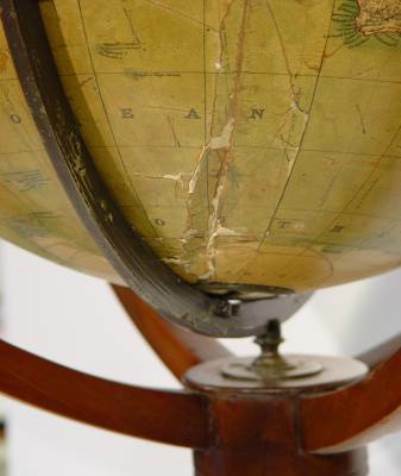 Most old globes can be repaired and restored if damaged or deteriorated. The surface of the globe and stand can usually be cleaned, stabilized and retouched. Broken or dented shells can be repaired. Badly damaged gores can sometimes be replaced with reproduced sections of similar maps that are trimmed and attached over the damaged or missing areas, and toned to match the surrounding surface colors. Replacement areas can also be digitally reproduced to match original losses. Many old globes have yellowed or darkened with age. This is caused by acids in the wood and papers used to create the globe and/or the varnish layers that were applied over the paper surface of many globes. In some instances, this discoloration can be reversed or reduced by careful and controlled cleaning by an experienced conservator. The map can quickly and easily be destroyed by improper cleaning. The horizon ring is a circular band that is typically made of printed paper laminated to wood or metal. These, too, can be restored. The materials that were used to fabricate most globes are sensitive to climactic change. It is important to store and display antique globes only in an environment where temperature and relative humidity are controlled and constant. Exposure to ultraviolet light can fade the maps, darken and yellow any surface varnish that may have been applied over the maps and trigger splitting and separation of the globes support shell and gores. Paper panels that are fading and starting to peel can be cleaned and reattached to the shell. • Don’t apply tape over the surface for any reason. Douglas Eisele is from the Eisele Gallery of Fine Art and Old World Restorations, Inc.